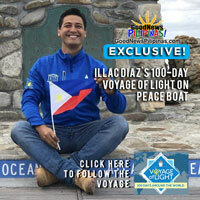 Today marks one month since Illac Diaz and A Liter of Light (1LL) team went aboard the Peace Boat for their 100-day journey at sea around the world – dubbed the Voyage of Light – in a mission to light up remote communities using Filipino technology. Liter of Light solar lanterns, which first lit up Philippine communities left without power sources when super typhoon Haiyan/Yolanda ravaged the country in 2013, are being made on board the Peace Boat by travelers on the cruise ship which docks in 19 ports. 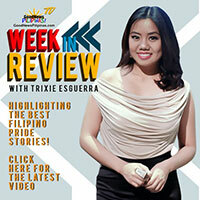 The Filipino tech design of solar-powered lamps was brought on board the United Nations Sustainable Development Goals partner Japanese cruise ship that is also marking its 100th journey of bringing various advocacies around the world. Diaz’s 3-member team on the Peace Boat has now grown to over 200 volunteer cruise travelers who are being taught how to make the open source technology and inexpensive lamps which last 5 years using recycled bottles and parts easily found for donation to communities at every stop. The A Liter of Light volunteers teach marginalized communities how to use recycled plastic bottles and locally sourced materials to illuminate their homes, businesses, and streets. Before boarding the Peace Boat, the Liter of Light had installed more than 350,000 bottle lights in more than 15 countries and taught green skills to empower grassroots entrepreneurs. Liter of Light’s open source technology has been recognized by the UN and adopted for use in some UNHCR camps. Liter of Light is the proud recipient of the 2016 St. Andrews Prize for the Environment, the 2015 Zayed Future Energy Prize, and a winner of the 2014-2015 World Habitat Award. A Liter of Light (Isang Litrong Liwanag) Voyage of Light on the Peace Boat began in Tokyo on December 26, 2018. The partnership brings affordable lights around the world in 100 days. The Liter of Light – Peace Boat voyage partners made a brief stop in Kobe on its way to China, engaging cruise travelers to make solar kits to be donated to communities at every port of call. The Filipino-led Voyage of Light arrived at Xiamen, China on December 31 coinciding with the Liter of Light team conducting its first presentation onboard. They welcomed 2019 with a departure ceremony and a New Year’s Eve celebration. Next stop: Singapore. The Voyage of Light arrived at its first port call in 2019 in Singapore on January 5, 2019. The Liter of Light Team sent special greetings to friends at the Festival Internacional de Innovacion Social whom they will see again at Valparaiso, Chile on February 26. 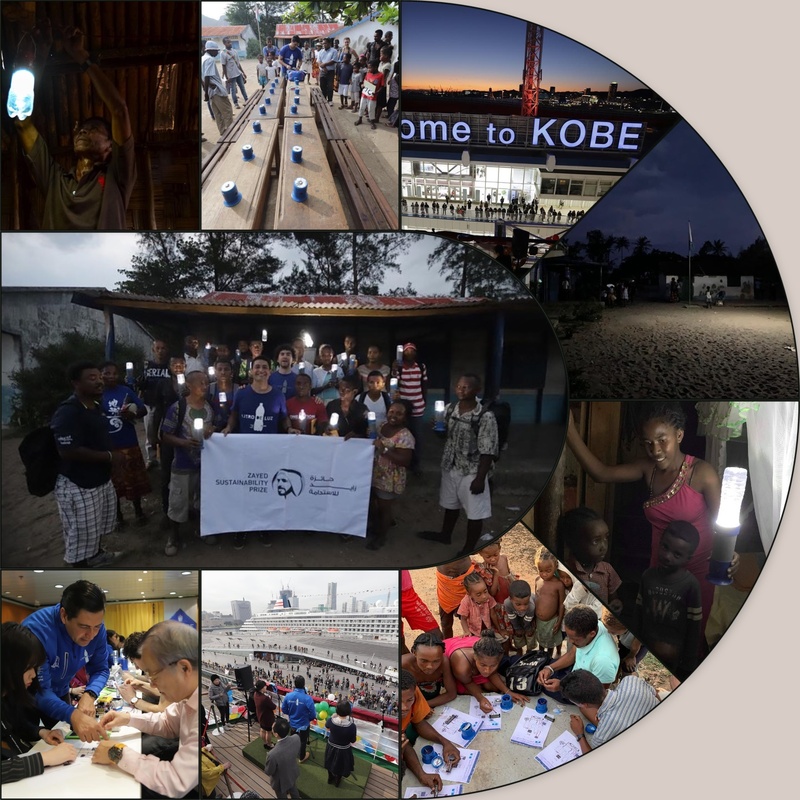 On the 9-nine-day sea travel from Singapore to Mauritius, the Liter of Light team first engaged 20 travelers who made the ship more than just a transport for the lights – the Peace Boat became a solar lamp factory at sea. The 20 cruise travelers became trainers themselves and grew to 200 volunteers for the factory at sea that creates environmentally-friendly solar lamps. The Voyage of Light landed in Madagascar on January 19 and the team went from the port directly to the community where they trained locals how to build and assemble the simple house and street lighting technologies which were actually used soon after. On January 23 A Liter of Light arrives in Fort Dauphin where school children were taught to make their own solar lamps in less than an hour. In SOS Village, orphans found glimmer of hope in every light they built. This is grassroots! This is how A Liter of Light works- teaching and transferring solar lighting technology, one bottle at a time! 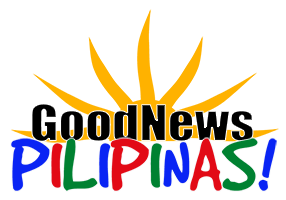 Subscribe to the notifications and email newsletters of GoodNewsPilipinas.com for more of our Exclusive Coverage of how Filipinos are leading the 100 Days of the Voyage Of Light to gift the world’s communities with cheap renewable solar energy.